Sorry for the late post yesterday. I forgot to push the right button. I was thinking about the Sparks following in Romania, celebrating Ground Bear Day. Then it was close to sunset in Romania by the time it was posted. I hope I got Ground Bear Day right! Tone 3 holds the Intention of Movement. Movement and Sound create Vibration. When we disseminate the thoughts of our Intention, when we Speak the Dream or take our first step toward it, we bring Life to the Vibration of our Dream. A Vibration of Love establishes itself in the world Below. When we see something clear enough to move toward it, it manifests in Spirit. Our Spirit has already seen the destination. Eagle/MEN is the nahaul that flies in closest proximity to the Creator. From Above, Eagle has a Divine View of everything. It doesn’t see the obstacles that are visible on the path below. It sees the Direct Path to a Dream. The Eagle Knows that if it can see the Place it will arrive at the perfect Time. The Jaguar lay down the footprints for a Flight into the realm of Spirit. The Eagle navigates by Intuition. An Eagle can see its prey over a mile away (1.99 miles). It doesn’t calculate the distance or wind speed. It doesn’t even think about the Way. It gets there by focusing on what it sees, and taking off – believing it will arrive at this perfect Time and Place. Eagle/MEN serves the Meaning and Purpose of an Intermediary. Sharing it’s Wings and Gift of Vision, the Eagle lifts us up to see something for our Self. We can never believe anything until we see it for our Self. We can only hold the Power of Believing when we Know that WE have seen it. Once WE see it, it will become OUR TRUTH. If we Knew that the Miracle of ALL our Dreams was waiting for us at an altar, we would fly there. Nothing could hold us back. It’s hard for Human to see that giving up everything we believed before, and giving up everything we thought Human Knew about getting there, IS the Answer. All Human knew how to do was calculate and reason. How could we possibly get there by giving up on all the Human tools we have at hand? We can’t. But our Spirit can. So are the Monarch Butterflies following their invisible path of Light. Humans are watching for the first Sign of the Spring migration. When the Milkweed is seen emerging from Mother Earth, it signals that the Monarchs are on their way. Mother Earth and the Creator raised together the Light of the Way. The first Human sighting in the USA will be posted here, on the JourneyNorth data collection map. Though, Earth will signal the first Sign through an Offering of “Mother’s Milk.” How Divine is that? We can reach a Divinely Planned destination by a guidance system the Creator placed in us. We are connected to it from an Altar within and a Channel of Light will lead the way. We’ll be called to the Light that offers a Nourishment of Spirit. All we have to do is follow the footprints of Love, Gratitude, and Appreciation for a Destination created just for us. We only have to Believe what the Earth has been showing us, and what Mother has been telling us from the Beginning. The Divine Destiny we Choose is as good as in our hands. We’re being led to it. Why would a Creator who designed everything down to the last detail, a Creator of Time that Knows Every Time and Place, offer this navigation system to other living things, and not to Human – for the journey of our life? Even planets were given an orbit. Our Heart Knows the Answer. It only makes Divine Sense that our path would be Illuminated by Light from its Beginning to the End. When we give up our Human way for a Divine Way, we CAN Believe we’ll get there. The light of a little Spark is all we need to see the Time and Place in the darkness along the way. Those born under the sign of the Eagle are said to hold the opportunity for success, based on their ability to see into the future. Imagining their Dreams, they hold a Discernment in advance of where things end up. Eagle can share this discernment with us. Eagle’s discernment is about as simple as it could get. If Eagle can SEE it, it knows the prize is within its grasp. I was born early morning, which means I’m a late-blooming Eagle/MEN. My Time and Place at 68.4 years old is to be here for anyone who thinks they’ll never “get it,” or thinks it’s too late to manifest a dream. I have clear vision for that. We were each born in the perfect Time and Place for our own Divine Destiny. “The eagle eye is among the strongest in the animal kingdom, with an eyesight estimated at 4 to 8 times stronger than that of the average human. An eagle is said to be able to spot a rabbit 3.2 km (1.99 miles) away. Although an eagle may only weigh 10 pounds (4.5 kg), its eyes are roughly the same size as those of a human. As the eagle descends from the sky to attack its prey, the muscles in the eyes continuously adjust the curvature of the eyeballs to maintain sharp focus and accurate perception throughout the approach and attack. If Eagle can spot it’s prey by a speck of a distinctive color under a bush 1.99 miles away, with Eagle Eyes we only need a glimpse of our Dream to focus in. Everything in me tells me that a Creator who wanted us to reach this destination would make an extraordinary way possible. Today we are called to Believe in this Way, to bring our Dream into sharp focus, and Know that if we can see it at all that’s all the proof we need to Believe we will arrive. Humans were given a Divine Guidance System. It’s Divine because unlike all the animals, we have to Choose to Believe in it. Our first Choice was to Believe in something greater than our Self. Reed, the “hollow bone” cleared the flesh from the bone so we could See into a dimension where a Light would shine a way. Human has so many beautiful gifts, only worthy of Divine Children. We hold the Power of Time and Place Illuminated by the Light of Love. We were given a place to play with all our Spiritual Tools in the realm of our imagination. All the Gifts manifest in a world Below, when we realize that Spirit is our True place of Reality. Our Consciousness is ageless. Our One Body of Consciousness stores up a lifetime of memories that belong to no one else. THIS is the True Identity in the SUM of who we are. It only takes one Miracle to turn a failure into a Genius. Our Spirit shares the Eagle’s Eye. We only need to Know the possibility, to See and Believe our eyes. That’s how we all can lead each other toward this Light, Seeing Light incrementally. We started the journey on solid ground. Now, we’re prepared to see a Higher Light, a path that shines in mid-air. Like the substance of a Rainbow, our Spirit was given the Eyes to follow an ethereal path of Beauty. Jaguar led us to a Higher Path made visible at the altar. The path the Creator manifested for our Spirit to see, was as Beautiful as Love. Along with the Light, the Creator’s path included the “Calling” in our Heart to follow. If we’ve been Called to follow a Divine Path, it means our Spirit knows and Sees the destination. It’s the only Truth that aligns with all the other Truth we’ve learned about a Creator who sees us as Sacred in the attempt to make the Journey. The Creator would ONLY lead us toward the Dream we were Divinely Inspired and Gifted to Create. All we have to do is Believe in the Dreams that are Divinely Inspired by our Love, and hold this Vision of our Future. We will never have to calculate a step, except to follow the next Inspiration of something we Love, that looks as clear as something right in front of us. Giving our Love to the “Calling” of another Human Being, we’ll be one step closer. Giving our Love to a “Calling” of a new Creation, we’ll be one step closer. The Beauty of this Rainbow of Light, is that we always take one step closer in a choice to do something we really Love. It might be the next arts and crafts. It might be a physical challenge that inspires us. It may be a new invention, a poem, a song, or building a dog house. It doesn’t matter what it is. If we love doing it, it’s a path to Enlightenment. When we really love something, it shines a Light on a talent that we inherently hold within. Loving it creates the curiosity to know everything we can know about it. Love leaves a trail to our own Genius as Human. IMIX, our primordial Mother, shared the Truth that if we Follow the Dream we Love, we’ll be Identified as a Genius. Love is the Divine Provision for Harmony and Equity of the Whole. We see people with extraordinary disabilities who have still been capable of Heroic accomplishments. I think of those with Downs Syndrome, and how so often their Gift is one of extraordinary Unconditional Love. And, I think of Stephen Hawkings, who didn’t give up on life when he lost all ability to even move. There is a Light shining in all of us to do extraordinary things when we do it for Love. This is Light that our Spirit can See. Our Eagle Eye is centered in our Divine Consciousness. Eagle/MEN extends to us its High Hopes and Highest Aspirations. Eagle encourages us to reach the Highest Heights, so we can see farther than we’ve seen before to a Dream in the future. Eagle tells us to use our Eagle Eye… train in on a speck of color and light. Reach further than the Dream Human sees within its grasp. Reach as far as you can, and as High as you can Imagine, even if you can only see a speck. The Gift Eagle Brings to direct our first Movement is “The Believing” that whatever image of the Dream we can focus on in our imagination, is as Good as Knowing we’ll get there. We’ll See the Path that’s always cleared by Love. Now I see clearly why Ian Xel Lungold’s Spirit showed up for me to see. In the post from my last round, 2 Jaguar/IX was the day I Received a Gift from 1 Wind/IK that gave me the push to Believe in a Trip to Ek’ Balam. A Time and Place left the memory of another “take off” toward a Dream. Honestly, when I received this Gift of a possibility, my first instinct was to push the idea away. It was too big for me, more than I could believe or see for myself. In Light of a Possibility, I saw the reason I’d never made a plan before. I was afraid to go. It was a safe dream as long as it was just a dream that rested in my imagination. I also never saw enough Light in the plan to make the personal effort it would take. It all changed when I grasped the Divine Reason for going. Ian Xel Lungold: Ian disseminated the Seeds of his final dream on October 17, 2005, preserved on MayanMajix.com. He shared the dream with us on 8 Flint/ETZNAB, a Holy Day of Divine Truth. We claimed Ian’s Truth in Ek’ Balam, 9 days and 13 years later, on Ian’s Mayan Birthday. After all, it was Ian who led many of us to the Light of the Tzolk’in, and the Promise of an Evolutionary Path that leads to the Consciousness of a Light we hold within. Ian’s gift and Destiny, 12 Sun/AHAU, was to help Humans comprehend our Divine Relationship with the Creator’s Love and Light. Under the trecena of MULUC, we would comprehend the Divinity of our Self as an Offering. May we Honor Ian for leading us to an altar, and claim for Ian that the last dream he held came True. The Eagle lies in the West, the Direction of all our Unknown Experiences. Everything we need to make this journey came from the East, the direction right in front of us. We never have to fear a journey that was inspired by the Sun/AHAU (Ian) who rose to shine a Light for us. May we give thanks for the AHAU in all of us, part of our “all-in-one,” that has Seen Clearly, and still Sees, the Brightest Light of Life, Illumination, and Happiness. To all my relations, may we be Eagles for the day. May we fly as High as we can, to see as far as we can into the future of something we Love. When we think we’ve caught a glimpse, may we look again for something even Higher. May we recognize the Divinity of our Spirit in the capability to even imagine this. May we follow our Divine Nature that soars in an ever-upward Spiral, always reaching for something Above, instead of Below. May we Bring to Life the Vibration of our Highest Dreams. May we Believe in Ian’s Light of AHAU that led us to an altar to claim the Highest Dream we can imagine. Ian’s Dream was to shine a way toward the Light. It takes the Monarch Butterfly, the “King” of butterflies, 4 generations to make the trip. Ian was among the first to disseminate the Wisdom of the Tzolk’in when the Maya shared their Sacred Wisdom. What if Ian’s “going before” was the first leg of our Monarch journey? All things are completed on Mother Earth in 4 turns. If we marked October 31, 2018 as the end of the first generation butterfly, where might we be, by the end of 3 more rounds of the Tzolk’in? The Tzolk’in and the Haab planetary calendar can tell us. 13 Sun/AHAU is the Ascension day of the 260-day round (Kin 260). Our first landing in the New Haab Year is August 27, 2019. The Year Bearer 7 Road/EB manifests the Balance of our Human Destiny. Humanity Sees all that IS and all that IS NOT. Our second landing on 13 Sun/AHAU is May 13, 2020… about the same day that the Swallows return to Capistrano. The Haab year guided by 8 Earth/CABAN shines the Zenith Light of our Divine Destiny on Mother Earth (conceived on 1 Dog/OC). By these calculations, our 3rd leg, and the 4th leg (including Ian’s) would arrive on 13 Sun/AHAU on January 28, 2021, 22 days before the Haab new year, February 19, 2021, Year Bearer, 9 Wind/IK, conceived on 1 Jaguar/IX. The breathe of Ian’s last Dream, spoken by Wind/IK comes full circle back to a Jaguar journey, given a push by Wind. May we claim a Dream that Ian is doing what he always did, leading us to an altar of a Brighter Light. He went before and seated an Understanding and Foretold a future Light with Miracles along the way. AHAU would encourages us to go for it! ANOTHER DIVINE SIGN: I reached out to Michael Shore at MayanMajix.com to share Ian’s presence here. He explained how they arrived at the name MayanMajix. IX was added for the Jaguar. Time and Place of Ek’ Balam related to Ian Lungold and MayanMajix.com. SHARE FROM 1 WIND/IK: Minisa shared a song just in time to include in the post. It may be copyright protected for sharing, so here’s the link. I’m grateful for Divine Inspiration that is given with its own path of Light. We’ll be drawn to it by the Call of Love. It’s our Divine Destiny, the one the Creator will call us to. I’m SO grateful that Michael Shore carries on Ian’s Mission. I’m grateful for all the 260 Kin (pronounced k’eye’n) that are ALL of US… eyes opened in a Dream to see Miracles. 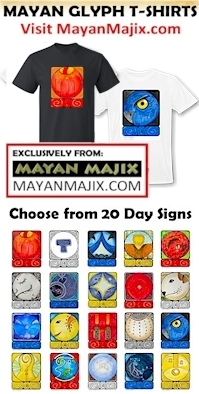 Cherokee, Eagle/UWO’HATLI: Eagle’s symbol is Mars the Spirit Warrior. He is a minion of Grandfather Moon. Eagles were the warrior society, the braves the protectors of the nation. Women were included. There was no discrimination which is reflected in the language: third person singular is divided into animate, human and animate, not human instead of he and she. The energy of high hopes and anticipations, dreams and visions, cosmic consciousness and commitment. On earth, a provider of excellence, leader, husbandry, care-taking of others, financial security and inheritance.s symbolized by comets, meteors, shooting stars, fireballs, and magicians. Meteors appearing around the middle of November are Heralds of the Coming of the Light, the Cherokee New Year. Panther is the Shadow of the Sphinx, Herald of the Dawn, guardian of the night when the sun is traveling through the underworld. Panthers have unlimited imaginations, visualizations, and are spellbinding speakers. The Cherokee Totem Jaguar is the guardian of the portals to other dimensions; shamanic abilities will open; multi-dimensional magic; healer, leader, way shower energy when used for spiritual growth. Abuse would be for using this power for control or negative purposes; must find a powerful balance. Ix: The Kab’awil represents the heart of the planet, the female reproductive tract, the face of a jaguar and points east on the world map. Ix: woman, tiger. Conducive to pray for grandmothers, mothers, daughters, sisters and wives day. For wisdom at 4 Balances, cunning and protection of Mother Nature. To thank the Earth for sustenance. Ix is the native cunning, enterprising, vigorous, bold and realistic.